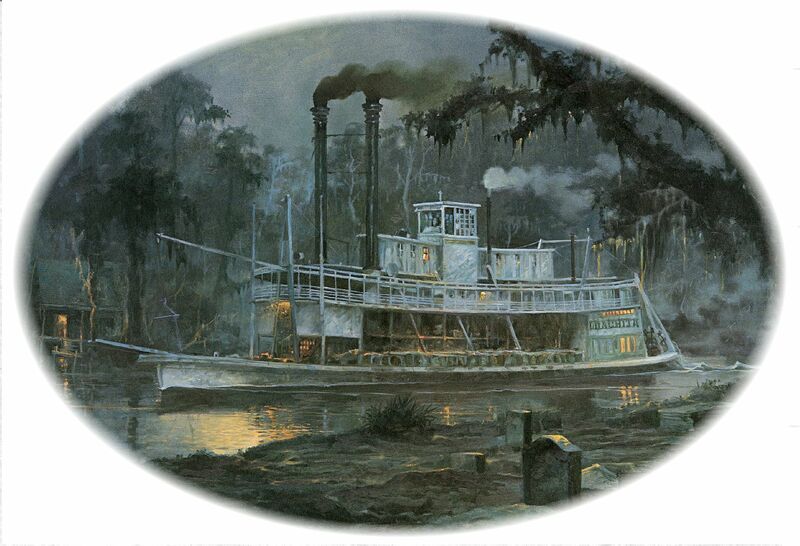 Model for ghostly Steamboat Ouachita illustration, below. $4,895.00 Offered for sale with the Submit Best Offer option and will likely sell before the listing ends. "Original Jazz Music At Night", is an alluring depiction of New Orleans' People and Culture. The immaculately detailed artwork, saturated with vibrant color and intricate detail, is of impressive craftsmanship and size, measuring approximately 18" x 24" and 28" x 34" with the custom frame made specifically for this painting. It is being offered for sale with the Submit Best Offer option and therefore it will likely sell before the listing ends. The steamboat S.S. BROWN was built in 1906 in Pittsburgh and taken to Memphis the same year and after that operated only in the South. Later was converted to the excursion boat MAJESTIC. 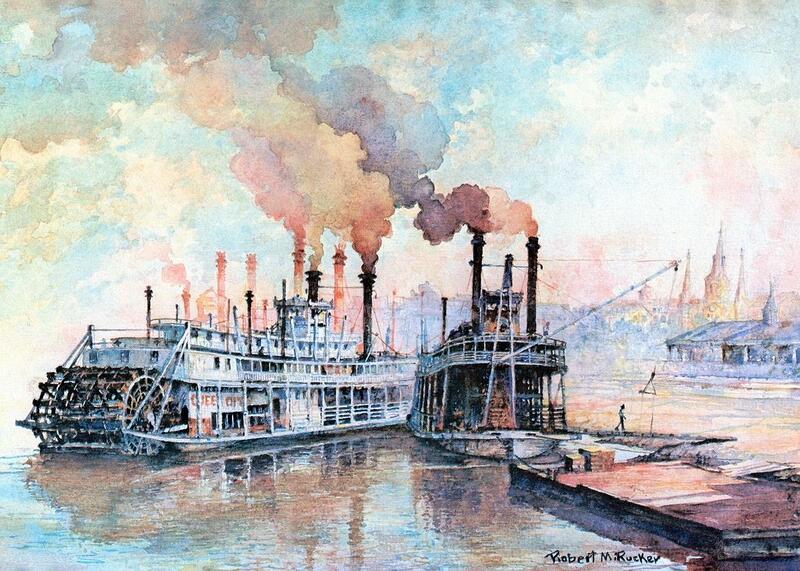 I just received a large print of Robert Rucker's "Ghostly Steamboat" . 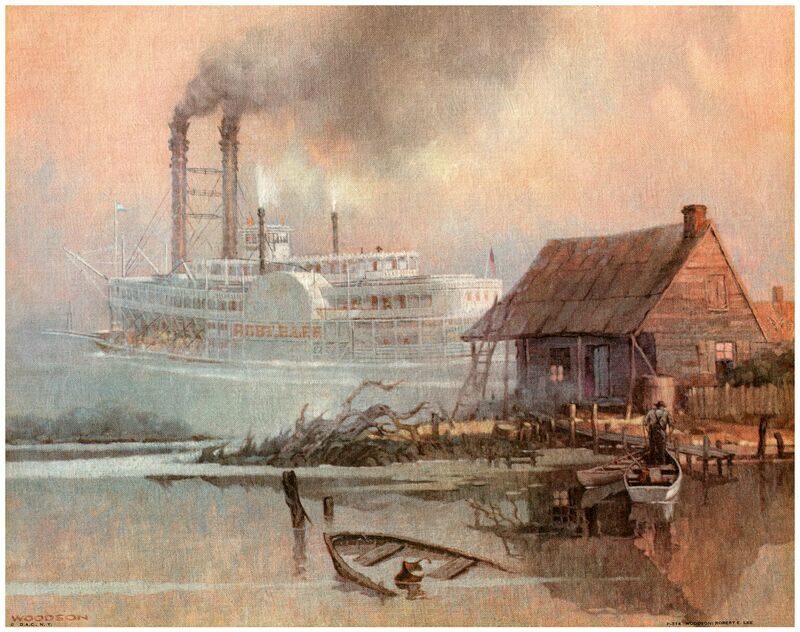 . . attached oval vignette version showcasing the boat and a photo that Jim Hale found on the Murphy site of the "Little Ouachita" after she was abandoned to the elements above Mobile around 1909 with her stacks leaning sadly from neglect. THE PILOT HOUSE WAS RAISED AND THE NARROW TEXAS BUILT IN FRONT OF AND BEHIND IT AFTER IT GOT TO MOBILE. 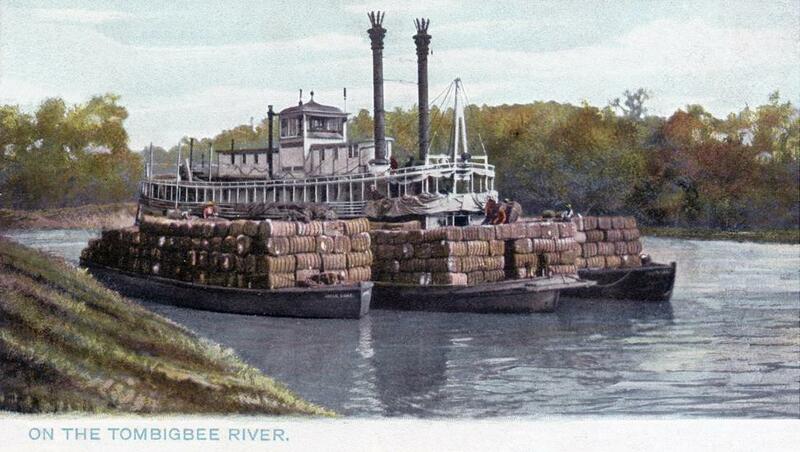 THE "LITTLE OUACHITA" WAS LAID UP IN 1909 OR SO ABOVE MOBILE WHERE THE PICTURE THE MURPHY LIBRARY WAS TAKEN. THE BOAT LOOKED A LOT BETTER BEFORE THE TEXAS WAS ADDED. 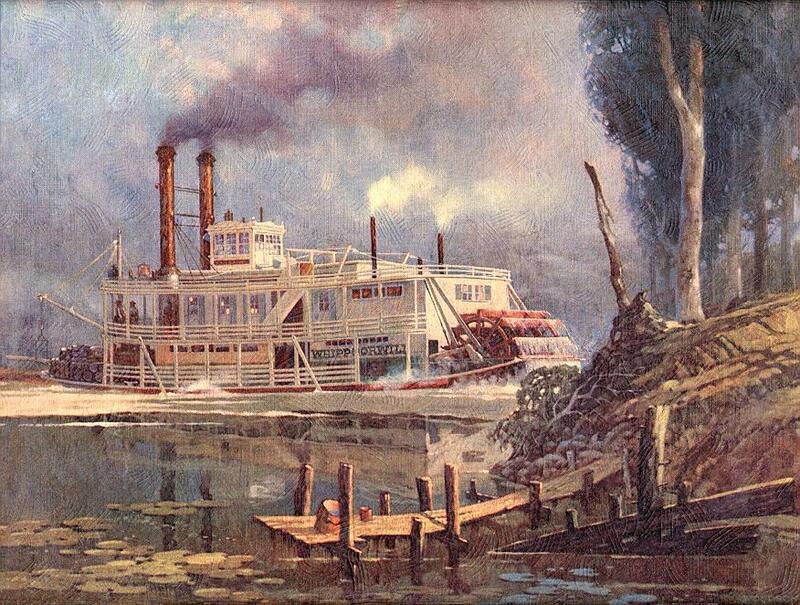 THIS PAINTING OF HER BY RUCKER, HAS TO BE THE MOST GHOSTLY STEAMBOAT PAINTING EVER. MAYBE SHE STILL HAUNTS THE BAYOUS ABOVE MOBILE EVEN TO THIS DAY. "Call Gilley's at 225 922-9225 for a price quote." Rucker's story is touching, he contracted polio as a teenager but was able to thrive as an artist. Robert Rucker was a native of New Orleans, and he opened his own gallery in the French Quarter at the age of sixteen. Immediately, Rucker found himself surrounded by fine artists of the New Orleans area, like Knute Heldner and Clarence Millet, two of his earliest influences. At the age of seventeen, he developed polio, an event that led him to art. Because of his illness, the Louisiana Department of Education funded his schooling at the John McCrady School of Fine Arts in New Orleans. Rucker studied under McCrady for the next five years, developing a style that would later become synonymous with New Orleans and the surrounding countryside of the Mississippi Delta. 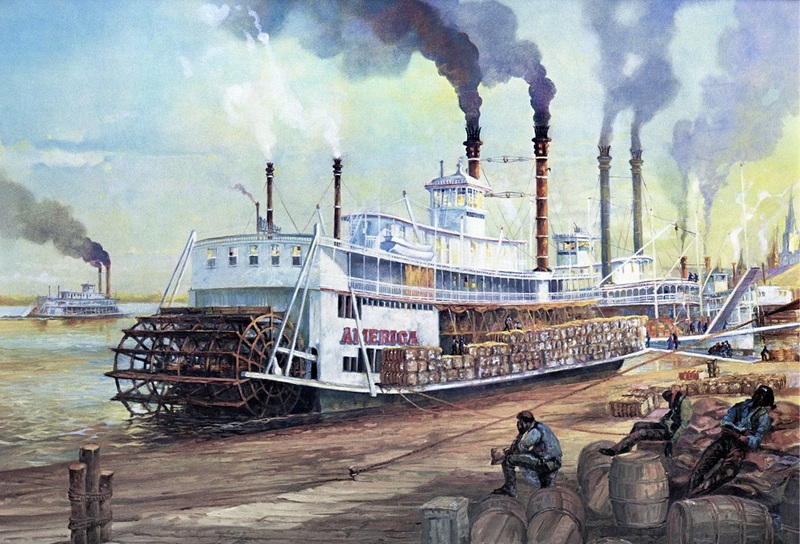 Rucker's most famous subject is perhaps the steamboat. His love of them came from his family, having two grandfathers who were steamboat captains. He produced many variations on the theme during his career. 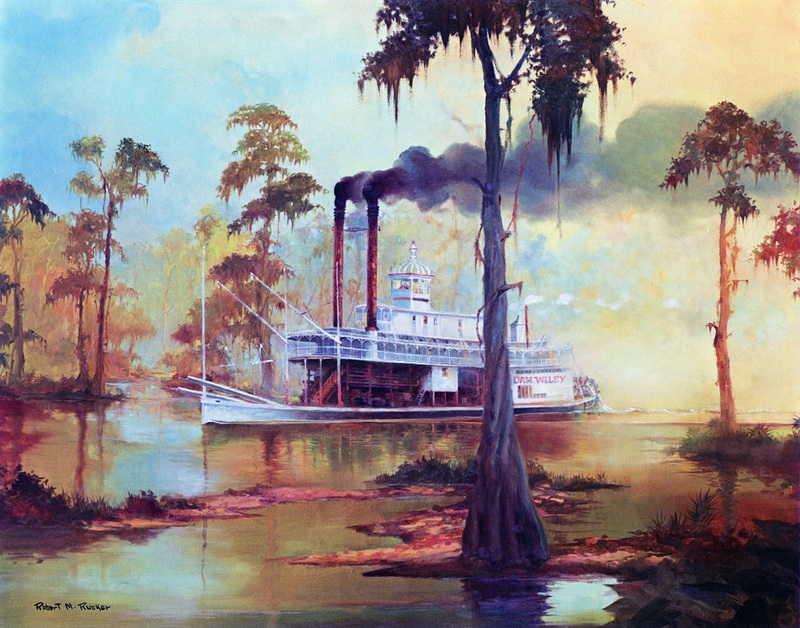 He is also well known for various bayou scenes and the south Louisiana countryside, themes that he eventually began to render in an impressionistic style and often with pastel tones during the late 1970's and early 1980's. Rucker held exhibits in Baton Rouge and New Orleans as well as Chicago, San Francisco, St. Louis and Cleveland. In addition to being an art teacher at his own gallery, he was a textile designer, an art teacher for the City of New Orleans and a medical artist for Tulane Medical School. Robert Rucker died of a heart attack in 2001. 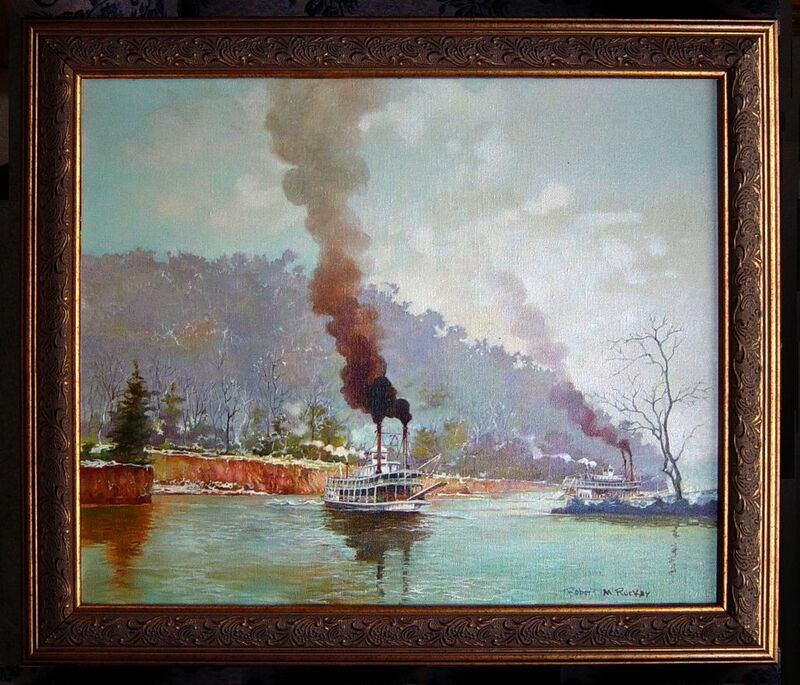 The steamboat pushing barges is the same one that Robert Rucker painted a "haunted" sternwheeler of and we paired up with a photo from the La Crosse collection. I scanned this from a postcard in my collection that was dated 25 December 1906 on the front, no post mark so it must've been enclosed in an envelope when it was sent. Raphael Tuck &amp; Sons' postcard Series No. 23709 "In the Land of Cotton." ART PUBLISHERS TO THEIR MAJESTIES THE KING AND QUEEN. Attached scan of a print of an impressionistic Robert Rucker New Orleans riverscape with the QUEEN CITY and other steamboats. 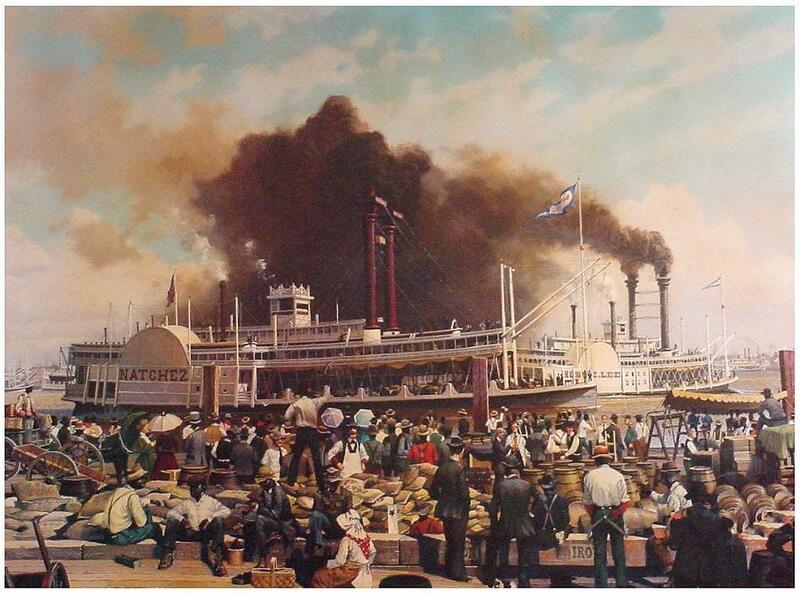 The smoke from the stacks and the French Market possess a watercolor translucence to them while the steamboats have a more opaque appearance and the St. Louis Cathedral in has a pastel quality to it. Haven't found an actual steamboat named DAN WILEY yet . . . maybe Rucker named it after a friend of his. This looks like the boat is traversing a bayou. One of Rucker's most charming paintings. The color enhancement from what was a predominantly warm tone is a result of a Photoshop protocol. Robert Rucker's painting of Captain Cooley's AMERICA. Jack Woodson's atmospheric ROB'T E. LEE on some foggy mornin' Down South with a fisherman's little riverside cabin in the foreground. From the warm color scheme on the cabin and it looks like the risin' sun will soon burn off the fog. Woodson evidently painted this as a piece of "calendar art" which could also be sold as a print in a standard 11 X 14 inch picture frame. Woodson was primarily a nautical artist apparently who specialized in sailing ships at sea rather than riverboats. John Stobart's sea-going ship paintings also outnumber the ones he has done of steamboats on the Inland Waterways. Sheet music specified that it was to be played in "Allegro moderato"
Commanded by the pilot, Mr. Steamboat Bill. Burn up all your cargo, if you run out of coal. "Then the MAIDEN CARE'll beat us to the Golden Gate." Oh Steamboat Bill, steaming down the Mississippi. Steamboat Bill, a mighty man was he. Gonna beat the record of the ROBERT E. LEE. The boiler it exploded threw them up in the air. "I don't know where we're going, but we're neck-and-neck!" Said Bill to the gambler, "Tell you what I'll do. I'll bet another thousand, I'll go higher than you!" When she got the telegram that Steamboat's dead. The next Papa that you'll have will be a railroad man!" 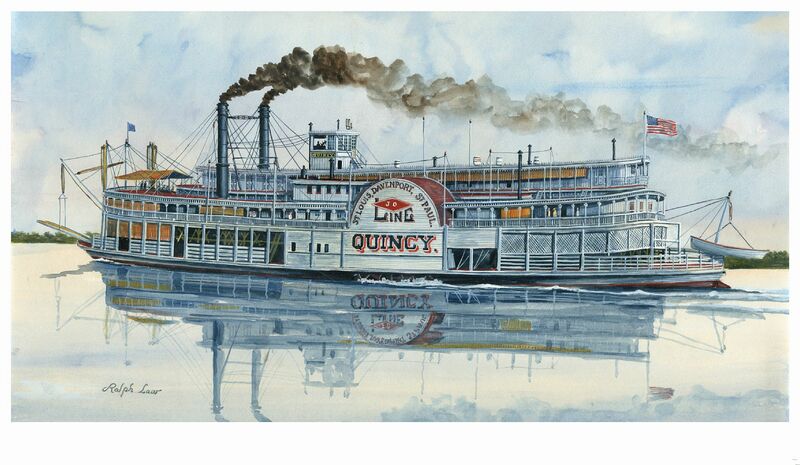 Original Ralph Law painting of the QUINCY which often frequented Hannibal, Missouri. A much photographed boat, I must have more photos and postcards of the QUINCY than any other. Width of painting seen here about 18 3/4 inches. 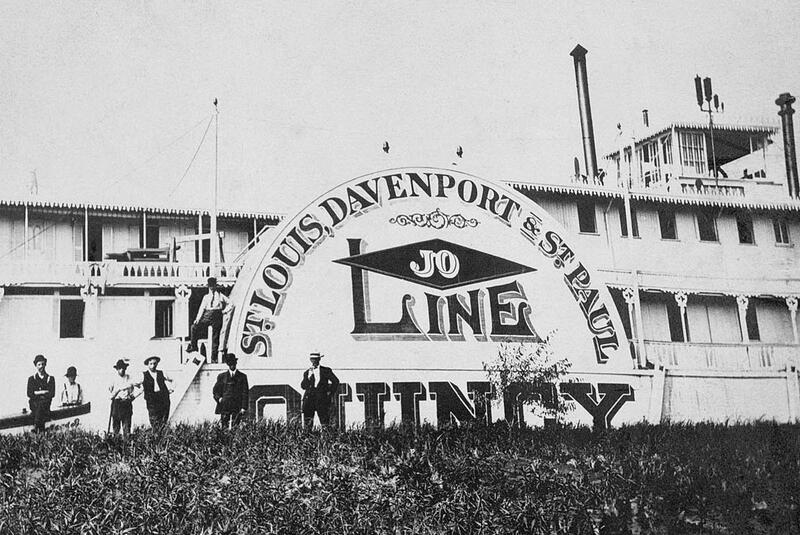 1918-19, remodeled extensively and renamed the "J.S." DELUXE after Capt. John Streckfus. Some of her original equipment came from the GEM CITY. Here's a detail of the Law painting which may be worth including. Hairs from his brushes stuck to the illustration board here and there. 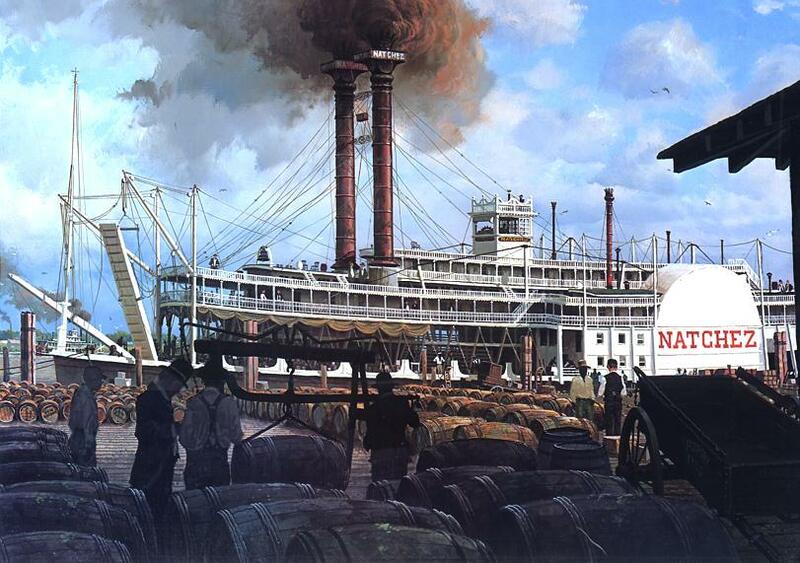 I saw Law's painting of the SPRAGUE in Nauvoo many years ago but it was 10 time what I paid for the QUINCY. Vintage photo of folks on the river bank posing in front of the Quincy's paddlebox. 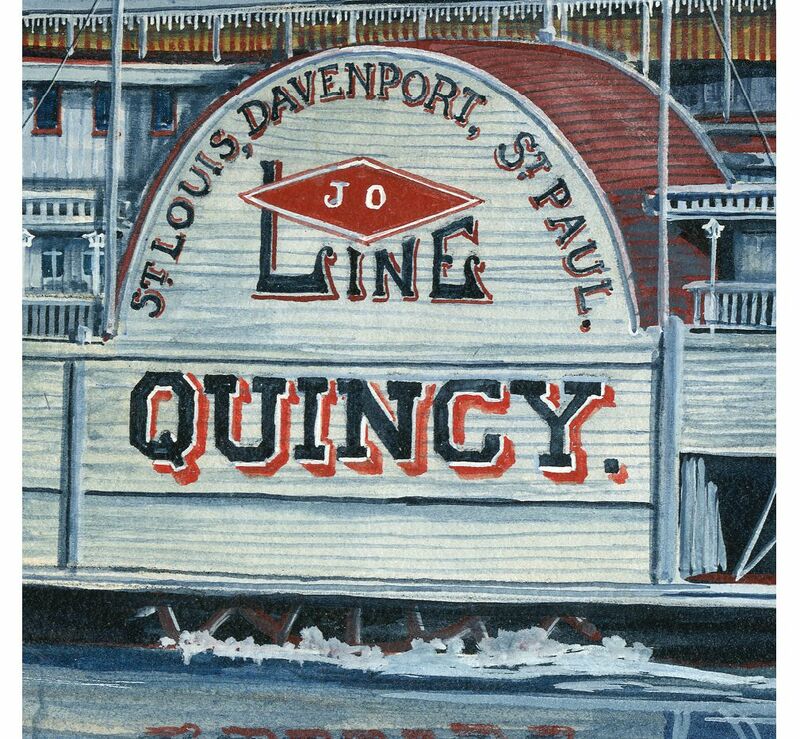 A colorful watercolor by Ralph Law of the DUBUQUE with diamond shaped "Diamond Jo" emblem under the name board on the pilot house. Above the sternwheel the name board reads "DUBUQUE of ST. LOUIS." The last steamboat to be named DUBUQUE was originally named the "PITTSBURGH" when it was constructed in Cincinnati, Ohio in 1879. The boat was purchased by Joseph "Diamond Jo" REYNOLDS in 1881 and operated as part of his steamship line until a storm destroyed much of her upper deck. The PITTSBURGH was towed to Eagle Point. At the Diamond Jo Boat Yards repairs were made under the direction of Captain John F. Killeen. 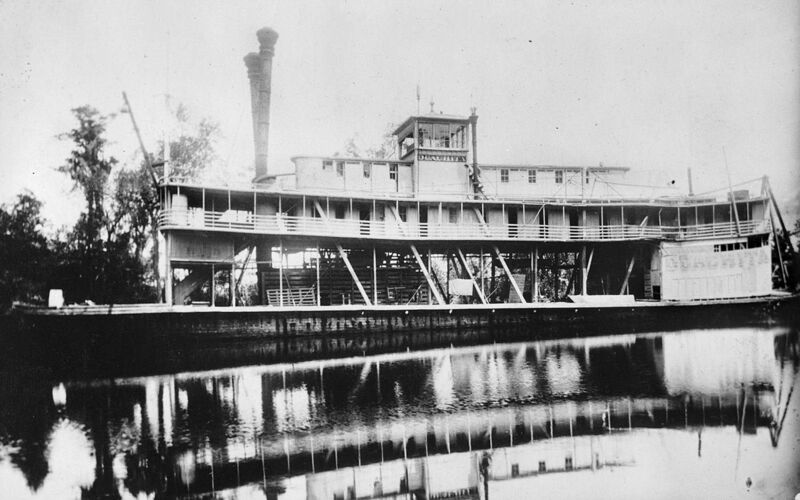 Renamed the DUBUQUE, the boat returned to operation until purchased by the Streckfus line and converted to an excursion boat named the CAPITOL. In her final years of operation, the CAPITOL ran as far north as Stillwater, Minnesota, and then moved south near New Orleans during the winter. 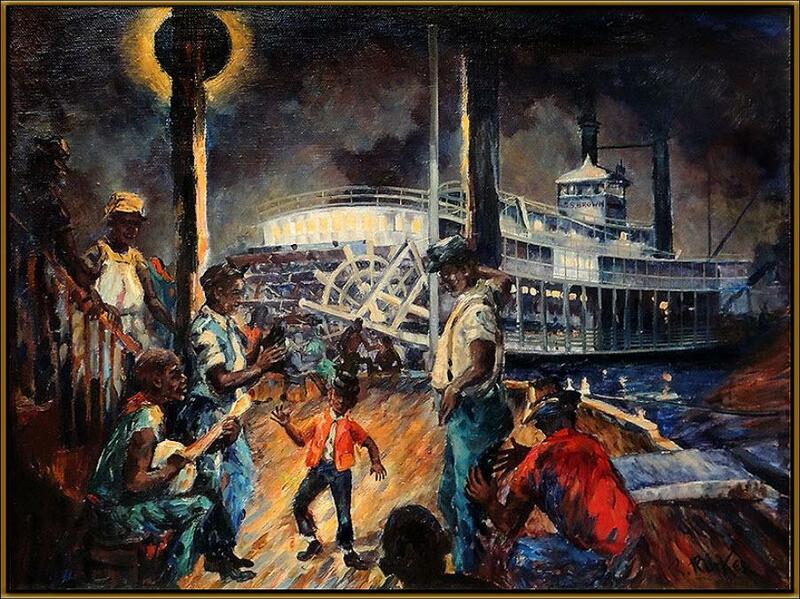 Attached is a print of another painting by Louisiana artist "James L. Kendrick III." What a handle! He does plantation homes and N'awlins scenes primarily and some steamboats as well. 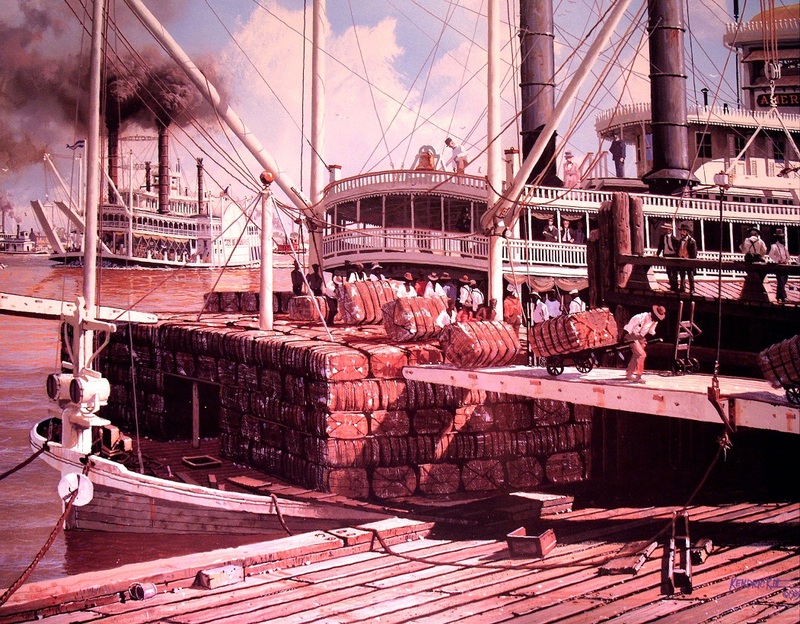 The cotton packed AMERICA in the foreground closely follows a vintage photo of the boat but the CITY OF MEMPHIS on the left bears a strong family resemblance to a painting by John Stobart of the J.M. WHITE (a detail of which is on the cover of Way's Directory). The swinging stages are lined up the same way in both paintings although there are differences in various other details if you compare them. 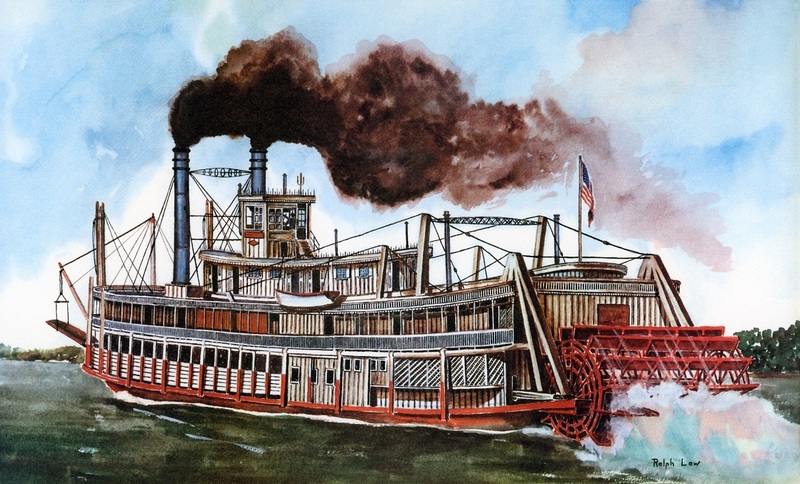 The NATCHEZ VI painted by James L. Kendrick III (whose painting of Cap'n Cooley's cotton packet AMERICA is a stand out in our illustration gallery, seen above). James L. Kendrick III's RACE OF THE NATCHEZ & THE ROB'T E. LEE. Believe this was off an online catalogue but it seems to be out of print now.